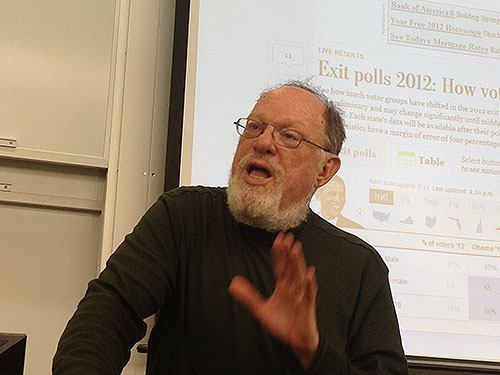 DePaul's Michael Mezey makes a point during his post-election analysis. President Obama was re-elected and the House and Senate didn't get the extreme makeovers that some expected. But DePaul University Political Science professor Michael Mezey told students Wednesday night that there was one big surprise on election night. Video: Mezey talks prior to the election about the effectiveness of the electoral college. What happened with Ohio and Florida was a question that was on everyone’s mind in the room. Both states tend to fall Republican, but have what Mezey refers to as swing counties -- counties located near major metropolitan areas that go back and forth from one party to the next. He said Obama did well in those areas. He also said there are a couple things that explain what happened in Ohio, one being the auto bailout. Florida's race is so close that the huge amounts of absentee ballots still need to be counted. Mezey said that issues with Florida are common. “It wouldn’t be an election unless we had something going on in Florida,” he said. At one point, Mezey referred to an exit poll that was posted by the Washington Post. It broke voters down by categories and stated which candidate gained the higher percentage. One of the top issues on the exit poll was the economy. Mezey said those who thought that the national economic condition was excellent or good would vote for the President, and those who thought it was not so good voted for Romney. Although looking at the map from this election shows a sea of red, Mezey said the argument could be made that Romney lost because he wasn’t a true conservative, and was unable to convince cultural conservatives that he was.